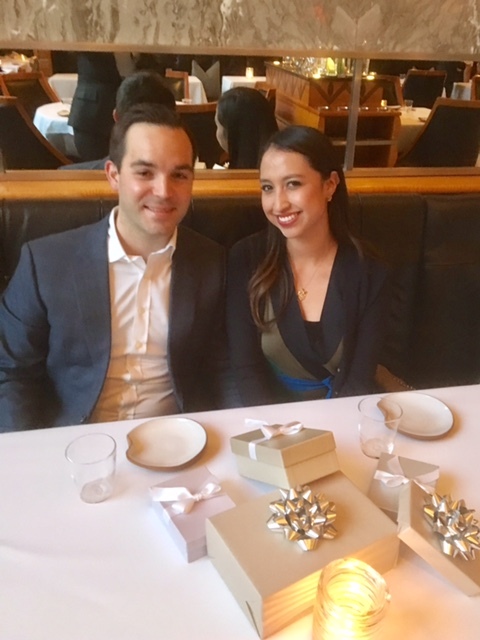 On February 14, 2017-Andrew and I cliched to the max and celebrated our two year anniversary/Valentines Day at Eleven Madison Park. This was a generous gift from his parents and we couldn't have been more thrilled! The experience was everything we imagined it to be for a Top 3 restaurant worldwide. Meaning--SERVICE SERVICE SERVICE. I won't spoil the experience for those that want to try, but you can see part of our first course, in the main pictures of this blog. I should actually preface by saying that the first course was a glass of Champagne--which we later followed by two more bottles of wine. I had only eaten a yogurt and a handful of almonds the entire day to make sure my appetite was ravenous, what I didn't account for was the lack of substance to soak up the alcohol! Needless to say I was drunk by the first course but we somehow managed to make it through the 3 hour experience. I don't know when or if we'll be back but I'm ecstatic that we got to experience it even if just once!